Director – General, National council for Arts and culture (NCAC), Otunba Segun Runsewe has assured that Nigerian traditional rulers as custodians of Nigeria tradition, history and culture will play prominent role in the strategic revival of Nigerian culture under his watch. Runsewe stated that NCAC believes in the enduring capacity of Nigerian traditional rulers to help change the present downturn and nose diving of Nigerian cultural and moral values particularly among the youths, regarded as leaders of tomorrow. Addressing the mammoth crowd at the closing ceremony of the Nzem Berom festival at Rwang Pam Township Stadium, Jos over the weekend, Runsewe noted that there are no denying the impact of effectual capacity of our traditional rulers to help arrest the growing incidence of crime, and other communal dislocations, hence NCAC’s determined efforts to make the royal fathers as central figures to revive the love of Nigeria’s culture and arts. “It is my candid opinion that our royal fathers are key to any government effort to relaunch our culture and traditional value system to the front burner of national economic and political development, particularly at this time when the government is determined make our way of life as key economic issue. “ Runsewe explained”. The NCAC DG who was decorated by the Gbong Gwon Jos and chairman of Jos Joint council of traditional rulers, Da Jacob Buba (CON) as a lover of Nzem Berom culture and a chief in waiting, told the festival crowd which includes the state governor, Hon. Simon Lalong, Imo state governor Rochas Okorocha, Senator representing Jos North, Former governor Jonah Jang and members of federal, state Houses of assembly, and traditional rulers across the country, that change in Nigeria cultural narratives must begin with the custodians of our tradition and culture whose grass-root cultural outreach cannot be over emphasized. 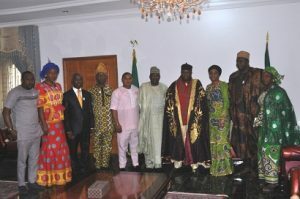 He commended Plateau state governor, Simon Lalong, Gbong Gwon Jos, Da Jacob Buba and all the traditional rulers and people of Plateau state for restoring peace to the state without which there would not be any meaningful socio-economic and political development in the land noted for its temperate weather and beautiful landscapes. To confirm the readiness of NCAC to champion cultural revival, Runsewe disclosed that the agency would from next year play very visible role in the marketing and promotion of Nzem Berom festival and further assured that festivals associated with other traditional rulers across Nigeria will henceforth enjoy NCAC input and support. Runsewe further stated that he would embark on national tour very soon to meet with all traditional rulers to seek their support and advice on how to drive the initiative and husband their strategic presence to reposition Nigerian culture.